I planted an elder tree about six months ago and it's growing nicely. Elders are not native to Australia and I don't know anyone who is growing it. I bought my plant at our local organic co-op. If you're growing elders can you give me a few tips on what the plant likes and doesn't like? I planted the tree after I watched the delightful Hugh Fearnly-Whittingstall's Spring program where he made elderberry champagne. His recipe is here. I have thoughts of making champagne for Christmas every year but I have no idea how long it will take our tree to flower to the extent I need for an abundant harvest of flowers. Any thoughts? 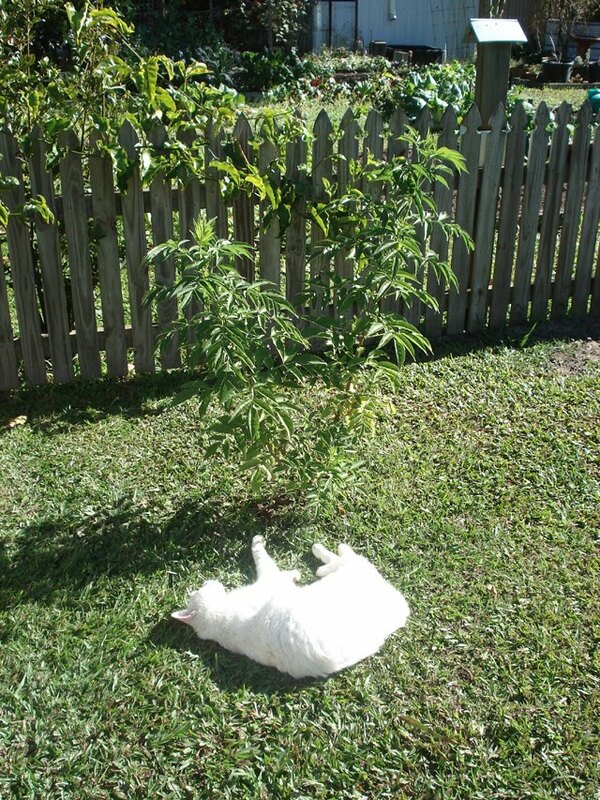 Our cat Hettie sunning herself at the elder tree. Making your own drinks at home is a wonderful extension to your from scratch meals. It cuts out preservatives and artificial flavourings and you control the amount of sugar you use. My favourite homemade drinks are lemon cordial and ginger beer and if you click on those links you will see the recipes I use to make them. However, there are a lot of other drinks you can make, either hot or cold, that will be more delicious than anything you can buy. They range from the wide variety of fruit cordials, to the fizzy ginger beer, milk drinks, including smoothies, to kefir, a yoghurt drink. All are easily made at home. 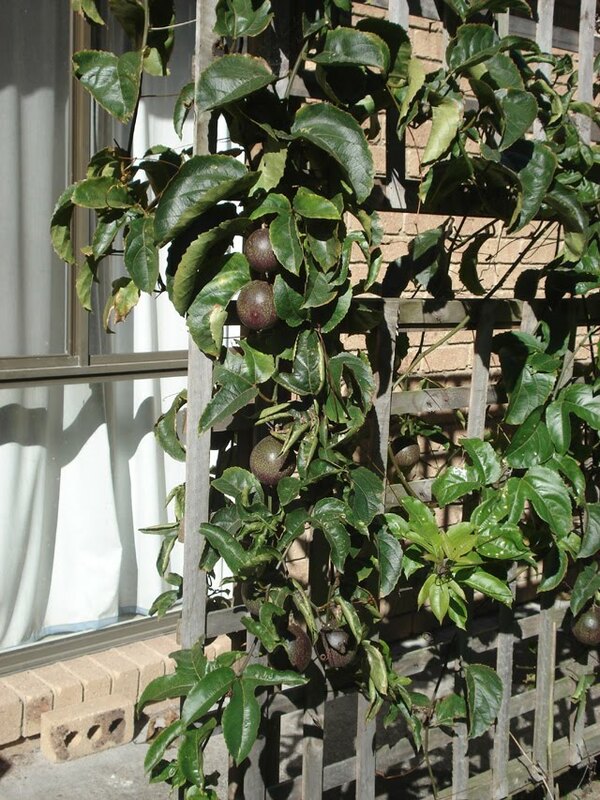 These black passionfruit will make a delicious drink. To keep it really simple, make up a sugar syrup of half water to half sugar, to the amount you need. For example, to make one litre/quart of sugar syrup, combine 2 cups of water to 2 cups of sugar in a saucepan and stir over heat until the sugar is completely dissolved. It will keep in the fridge for a couple of weeks in a sealed bottle. Then just juice whatever fruit you have and combine it with the sugar syrup. This will make a cordial concentrate that you would dilute with water when you drink it. Making something like this is a matter of following your own taste. You add more or less water, fruit or sugar according to how you like your drinks. Once you make up a bottle of cordial, store it in the fridge. It will last a month or so, depending on how such sugar is added to the liquids. Just one way to use the information in the paragraph above is to grab yourself a seedless watermelon when the season comes around again - I'm guessing you're right in the middle of it in the northern hemisphere. Cut all the red centre out and place it in a blender, add sugar syrup to taste, a couple of sprigs of mint and blitz it. Dilute with a small amount of cold water or mineral water if you want a fizzy drink, according to how strong you like it, add ice cubes and enjoy. This bright pink drink is a real hit with kids but adults love it too. What are your favourite made-at-home drink recipes? Hope your weekend was good. Your passion fruit is lovely. I have longed to get one planted outside the kitchen window when budget permits. dark cocoa power (non sweetened) cooked until dissolved well. Watch it and do not let it burn. The kids add it to the soy milk cold or hot for a treat. Your elder tree might take another 5-6 years of careful pruning until you might get enough flowers to use for your drink. Even then, you might find that it`s not producing enough. It will need cold spells during winter, also some frost to encourage it to flower more the following spring. I guess you will not see snow or hard frost where you are. I wish you luck with it. Sometimes, the experimental process of trying a new plant is just as satisfying. Hi Rhonda, I have just recently been reading some blogs where they are making their Elderberry Champayne and they nearly all mentioned needing 18 bunches.I will have to go look again and maybe see if they have a link for you,I did see that you need them to be lovely fresh opened bunches and that was a problem for some getting enough at one time, so maybe it will depend how prolific yours flowers as to how long you have to wait,it sounds lovely though doesnn't it.We have an abundance of lemos at the moment so we have squeezed them and frozen the juice ready for summer to follow your recipe.Thank you. By elder, I'm assuming you mean what we call elderberry. They are almost weedy around here (Niagara region of Canada), and need no special care, but are generally planted in shady areas - more, I think, because they are one of the few fruiting trees/bushes that can tolerate shade than any requirement for it. They also grow wild in swampy areas, and so do like a lot of water, although, again, I don't know that this is a requirement. I haven't tried any elderflower recipes, but I will be planting some bushes next year, and can't wait to try them. And thanks for the watermelon tip - I'll have to try that! I used to pick elderberries for my grandmother so she could make mincemeat pies and she also put them with apples for apple pie. I always found them near the creek in shady areas. They do like water and dont like drought. I would like to grow some but where we live now we dont have any shade. Grandma also used to make elderberry wine way back when. She's gone now and most of her recipes were in her head unfortunately so I dont have any to share. :( I think they would be great with kefir though. Rhonda - I bought a small elder tree from my markets about 3 years ago. It grew rapidly with no attention and is now a large tree producing many heads of flowers. I have made elderflower cordial(delicious) for the past two seasons, the recipe I used asked for about twenty flower heads. It can be found in the book 'Country Wisdom' by Rosamund Richardson. There are quite a few elderflower/berry recipes and a whole section on drinks, jams and jellies. I suspect your elder might grow quite tall - I wonder are they considered a weed here in the same way coffee plants are? I will be harvesting all the berries and will try an elderberry wine recipe sometime. Elder grow like weeds around us. Lots of my friends make the champagne and it's very nice. I agree that they grow best in shady, damp places. I don't think they particularly need a period of severe cold to flower well, our area is very mild and we have plenty of bloom. I've never really observed how fast a common elder grows but I have an ornamental and it has been slow to reach any height. Here in Florida they grow wild and crazy. I made jam out of mine years ago and elderberry wine. On my farm now, I have no elder trees. I miss them. But they grow along the roadways and fields. They seem to love water and sunshine. I also know that the mushrooms that grow on them are edible. I believe they are called Joshua ear mushrooms. Good luck with it and hope it is a succesful addition to your garden. 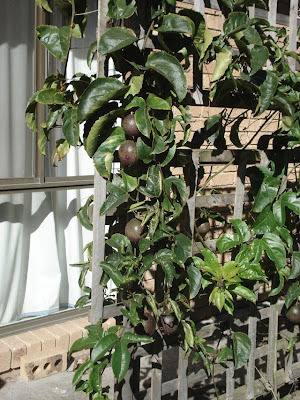 Rhonda, visited another of my fav blogs after reading your post about the elderberries. Thought you would enjoy. I planted 6 this year (bare root stock) as part of a hedge. PLanning tp make a lot of cordial, champaigne, beer, wine and pies. Good morning Rhonda. Your elder is looking good, mine was a sad tale. I picked up a seedling about 20 years ago and it grew well where we planted it but then we decided to build a verandah so it had to be moved. It survived the transplanting, I coaxed it along and then, would you believe, some years later we decided to build on for Mum just where the elder was! I instructed the builder that I would move the elder and under no circumstances was it to be touched as I had never seen another seedling. Well he did the right thing but the man driving the bobcat wasn't told and..well I think you get my drift. In the second position ours was in too much sun, the leaves got quite burned. I had good flowering after about three years even with the transplanting. Good luck! Hi Rhonda, one that is really good, and really easy, is nettle beer. It sounds scary, but it is actually mild and refreshing, and you can make it alcoholic, or not. I have no shortage of nettles! No Elder suggestions Rhonda - that is a new one for me! However our families FAVOURITE home made cordial (which actually came out of an experiment a couple of years ago after being inspired by your lemon cordial recipe but not having any lemons lol) is passionfruit - I throw the pulp of about 8 - 10 passionfruit into the hot sugar syrup and cook for another minute or two, then strain into my bottles (I use old Braggs Liquid aminos bottles because I fill two perfectly) - it is lovely and reminds me of Fruit Cup cordial, and I know there are no nasties in it! Hi Rhonda, I live in Brisbane and planted an elder tree a couple of years ago. I give it no attention whatsoever and it produces prolifically, more so in it's second season than the first. The tree is in a sheltered spot with a north-easterly aspect and is about 2.5 metres high. Seems like a very hardy tree and quite attractive. K said that you can make a pie with the berries - I'll be on the lookout for a recipe now. I suspect the comments about growing elders in the shade depend upon your temperatures in summer. In southern New Zealand they just grew as a weed and we kept those that self seeded in the right place, taking out the others. All of my elders were in full sun. Where we lived they grew to about 2 1/2 metres and were shrubby bushes. They and the flowering currant were the only shrubs that would cope with being almost eaten by the horses and then come away to flower again. My only caution is that you shouldn't have them near the washing line. The birds eat the berries then when they take off over the line attempt to drop their deposits on as many white items as possible! Hi Rhonda Here in the UK we try our best to get rid of elders, thinking of them as a weed or hedgerow tree. They selfseed so easily we have to be vigilant. I have made elderflower cordial, non alcoholic elderflower champagne, white elderflower wine and elderberry wine in my time. Locally it is said that after making elderberry wine, leave it for 10 years, then throw it out!! When I made it, after 6 months it was truly undrinkable, but after leaving it for 10 years, it was fabulous. Thinking it should be chucked, I had put it in the loft where it was frozen in our winters and sweated in our summers for 10 years. I found it when doing a spring clean, tried it and it was gorgeous. The elderflower wine, was utterly amazing after 9 months. Guests were given it with dinner and thought I had bought expensive white wine. The elderflower champagne was great after 2 weeks and the cordial was delicious immediately. I would really recommend you don't bother with the berry wine and concentrate on the flower wine instead. Elderberries grow wild here where we live. I have several bushes and am looking forward to bottling their juice this year as well as making more elderberry elixir for medicinal use. A few of my other favourite drinks to make and preserve are raspberry vinegar (a sweet and tart syrup), rhubarb syrup and black currant syrup. I make these and then can or freeze them and then we mix with club soda to serve them. A taste of summer all through the year. The elderberry champagne sounds like a delightful thing to try. I am not sure about where you live, but here in Virginia, elderberry bushes grow literally along the roadsides as weeds! They are very easy to grow and very prolific. I found the the ones we transplanted and grew in full sun (as oppossed the the ones in semi- shade along woody road sides)needed a good bit of watering, but they were still very prolific. The birds loved them and so do the japanses beetles. We removed them last year and have nearly zero japanese beetles this year. Also, love your new photo. You look much more relaxed, content and serene! Good for you! Thanks for all your hard work and God bless! Elderberry juice can be a very good remedy for soar throats as well as being a very good cold preventative medication. My grandmother would always make me drink hot elderberry juice during autumn and winter. It was delicious and I still remember the slight astringend properties it has when used as soar throat treatment. As kids we loved to drink it and never thought of it as medication. It's worth adding that elderberries and i think the flowers as well to some extent are powerful immune boosters. You can make a syrup from the berries for coughs and colds etc, there seem to be so many recipes for the flowers and fruits of this tree! However the berries should always be cooked, they cause digestive upset and I think may even be toxic eaten raw. I read somewhere though that juicing is ok as the skins are removed in the juicing process and that is the toxic part. Don't take my word for this though! We planted a Golden Elder about 7 years ago. In most years it dies down to the ground after our rough winters and then proceeds to grow to about our roofline (9 ft?). I've never been tempted to try elderflower cordial or the champagne, to be honest. It's a pretty tree/shrub/weed though. exactly what i feel like tackling rhonda- thank you! xo m.
My mum and I love watching River Cottage - I remember that champagne (though I would never drink it - I don't drink alcohol) as well. I like homemade lemonade....though it uses half a pound of sugar, so I've being trying to reduce that....one ounce less every time I make it! I used to successfuly grow elder in the western regions of Sydney, Rhonda. As another commenter has mentioned, it will perform best if you have some kind of frost hollow on your property to put it in. Fresh elderflower cordial is delicious! I was recently give the advice that when making raspberry syrup, it's best to let the raspberries ferment for a day first to develop the flavour. So I tried this. I mashed a pint of raspberries, let it sit (covered) for a day, then strained out the juice. This I placed in a saucepan with 1/4 cup of sugar, and boiled it for a few minutes. Then I put this syrup in the fridge, and have been diluting it with water and ice to make a delicious summer drink. Traditional cordial is fermented even more, actually. I'd like to experiment more with this in the future when we have a larger supply of fruit available to us. Here in the UK (East Anglia) elder grows like weeds. Most people try to chop it down because it gets very large. (It is an East Anglian custom to apoligise to the tree before youn prune or chop it down. We are a funny lot). I always make elderberry wine which is lovely. Very red and rich. Have had less success with elderflower wine and champayne althoughy did make some wine last year and my husband says it is very nice. A small bunch of flowers are lovely in stewed gooseberries (remove before you eat them). They give a lovely sweet, perfumed taste. You can also make elderflower fritters which are nice. I never got around to Elderflower anything this year. My aunt made the most beautiful sparkling cordial one year; and my other aunt had the bright idea to try and recreate it. I remember driving from hedge to hedge on the way home one day and collecting them (they are rife in Norfolk hedgerows)and thinking that the flowers smelt vile. Our attempt at making the cordial fell flat (no pun intended) and I have steered clear ever since. I have now started making wine and thought I would give Elderflowers another chance but never got around to it. I am glad that H.F.W. and River Cottage travel well, by the way! Hi Rhonda, we planted some Elders as part of a native hedge in our garden. They were bare root plants, about 2 - 3 feet high when they went in last April (2009). Nothing much happened last year but they have taken off this year and produced about 3 flower heads per plant. You may need to plant a few of them to get enough flowers to make cordial etc. Ours are against an east facing wall and our soil is quite poor - very dusty with lots of stones. We water them if the weather has been hot and dry for several days but otherwise we leave them alone. It was unusually snowy here last winter (south-east UK) so perhaps that helped, though I'm not aware that they need frost. Do keep us posted on how yours gets on. These drink recipes are posted just in the nick of time. We are melting here and I was looking for something new to serve my family. The watermelon sounds wonderful and you are correct they are just starting into season. No help i'm afraid on the elder. Here too they grow along the side of the roads with no special care. I have seen them in full sun and almost full shade. Hope you are enjoying your days! You may have seen it already, but I thought I'd pass it along.